The VISION® Burner technology ensures complete and efficient combustion with very low emissions; < 30 ppm NOx with little or no FGR. This sturdy and simple design translates into high reliability and low maintenance. The VISION Burner can be applied to both single and multi-burner boilers. 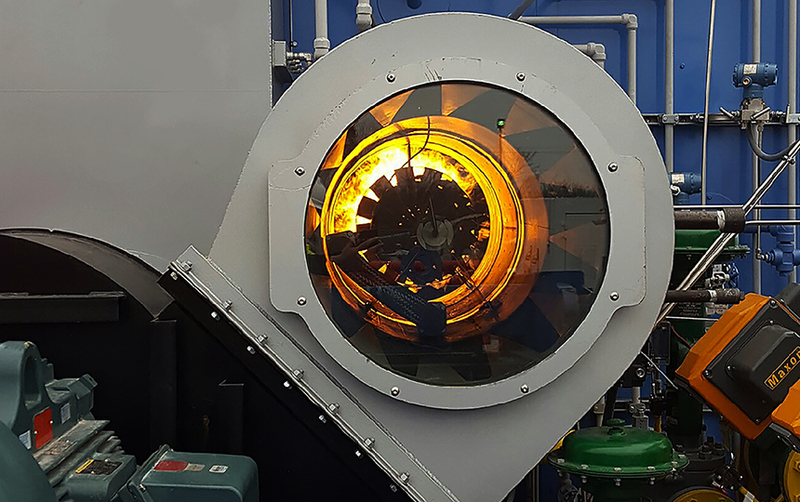 Numerical fluid flow simulation tools were used during the design of the VISION® Burner, allowing the traditional windbox to be replaced by strategically placed baffles and openings between the fan and the burner throat, making the burner very compact and efficient. The large glass VISION® Door allows for a safe visual inspection during burner operation, providing an unprecedented level of visual insight into the core of the flame as well as the furnace. The center core flame serves a dual purpose of igniting the main premix main flame while also stabilizing overall combustion during nominal operation. The core flame is capable of firing independently to increase the turndown ratio; well in excess of 10:1. Well suited to retrofit applications as well as new installments. Victory Energy is a leading, single-source boiler supplier of custom-engineered watertube boiler and package boiler systems.